Vasyl Cherepanyn, lecturer at the National University ''Kyiv-Mohyla Academy'' and head of Visual Culture Research Center, was attacked on Kontraktova square in Kiev, next to the university were he works. Vasyl Cherepanyn, PhD of Theory of Art, is a lecturer at the Cultural Studies Department at the National University ''Kyiv-Mohyla Academy''. He is the head of Visual Culture Research Center and Editor of the Political Critique journal. He is an organizer of numerous scientific conferences, public discussions and art exhibitions. Among the latest events, co-organized by Vasyl Cherepanyn, is the conference "Ukraine: Thinking Together", with the participation of Timothy Snyder, Ivan Krastev, Agnieszka Holland, Paul Bermann and other leading intellectuals, and also the series of events during the Open University of Maidan. While the military aggression is carried out against Ukraine, aggressive young men in military uniforms carried out an unprecedentedly violent attack on the university lecturer in the center of Kyiv. During the attack, the thugs were accusing Vasyl Cherepanyn of being ‘a separatist’, which is totally absurd to anyone aware of his activities. These unfounded and absurd claims, along with accusations of being ‘a communist’, are more and more often used by aggressive ignorants who aim to impose their ideology of hatred upon Ukrainian society, and to suppress any manifestations of critical thought. We demand a quick investigation of this appalling attack. We also demand to investigate the activities of paramilitary groups that use the war in Ukraine as a pretext to justify their own misantropic views. I know Vasyl personally and consider this outrageous attack on him, which has been most likely carried out by Ukrainian neo-Nazis, as an attack on the most intelligent and intellectual part of the Ukrainian society. Vasyl is known for his pro-Ukrainian, pro-revolutionary left-wing views, and, together, we took part in several events providing academic analysis of the Ukrainian revolution from social, political and cultural perspectives. 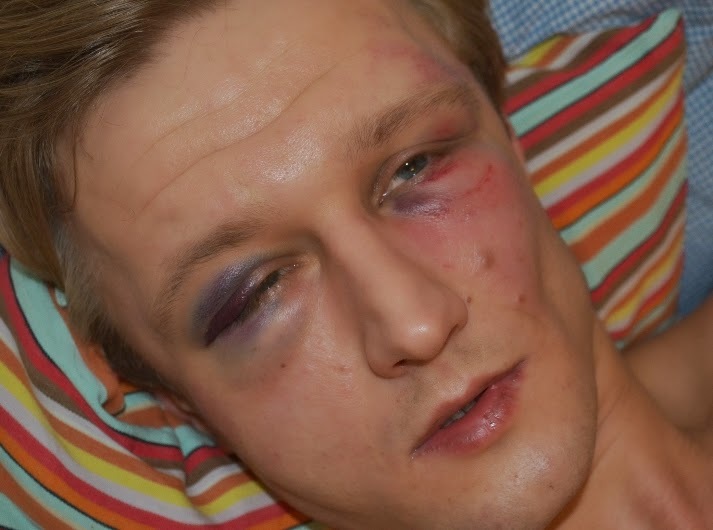 I join the VCRC in their demands to immediately investigate the shocking attack on Vasyl Cherepanyn and arrest all those responsible for this crime. Any proofs that the attackers were Ukrainains or that they were right-wing? As Vasyl is known for his pro-Ukraine view he should rather have been attacked by pro-Russia thugs or Russian neo-Nazis. There is too much indirect evidence that it was specifically Ukrainian neo-Nazis who attacked Cherepanyn. First of all, they have already attacked the VCRC in May 2012. Second, accusations such as "separatist" and "communist" usually come from the extreme right. So, if the attackers are right-wing extremists, then the question is from which group they are coming. My hypothesis is that they were from Svoboda's neo-Nazi wing C14, because their leadership know how Cherepanyn looks like as they were connected to the Kyiv-Mohyla Academy where he works. Moreover, the same thugs from Svoboda disrupted one of the discussions on the Ukrainian far right that Cherepanyn co-organised a few years ago. Given what you are saying, Mr. Shekhovtsov, I would say this sounds more like a provocation to promote the idea that neo-nazi thugs are running around the streets of Kyiv. Is there any reason why Mr. Cherepanyn would be singled out? There are scores of neo-Nazis in Ukraine in general and in Kyiv in particular. Cherepanyn is an intellectual and an opponent of Ukrainian right-wing extremistm, this is why they cowardly attacked him. Was it him who invited Rossolinski-Liebe or do I mix things up? No, that's a different story. Has the police arrested anybody? Not yet, as far as I understand. Ukraine is still a third world country. It is time for the "real" citizens to step up,and stop this kind of acts. Get involved,help each other out when trouble starts,like we do here in America.Help yourselves out a little,we gave you 50 million dollars,sheez !!!!
" known for his ... pro-revolutionary left-wing views..." What??? Marxism? Trotzkism? Bolshevism? Maoism? Pol-Pot? Can you specify?